Interests: 1:24n16", 1:18n1, 1:32n1, 1:32n20", 1:10n18", 1:12n7.5"
While I was recently conflicted between HO gauge projects in 1:32n20" and 1:24n16", I decided to build some long dormant Gn15" Heywood 3' x 6' cars that I thought would look reasonable in either scale. Starting on the kits renewed my interest in 1:12 scale modeling, with the kits representing half-scale models of Heywood cars in 1:12 scale. These were multimedia kits offered by Jeff Saxton many years ago, designed to use NWSL On30" wheelsets. 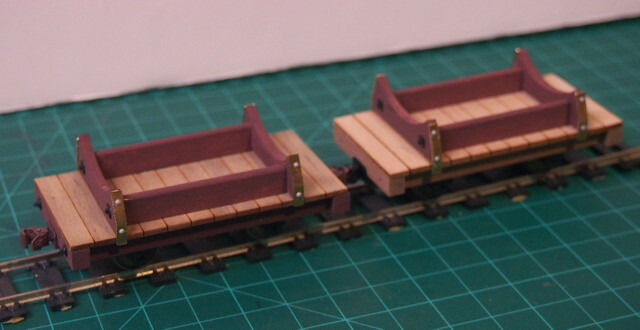 I modified the kits by cutting notches in the end beams to accept Kadee S-scale knuckle couplers, with the magnetic activating parts snipped off to allow mounting them at conventional HO scale coupler height. These were fit in and then secured in place with E300 adhesive applied with a scribing tool (cheap plastic dart from K-Mart with the plastic fin assembly unscrewed and discarded). To test size, I decided to build one each in 1:32n20", 1:24n16", 1:18n1, and 1:12n7.5". 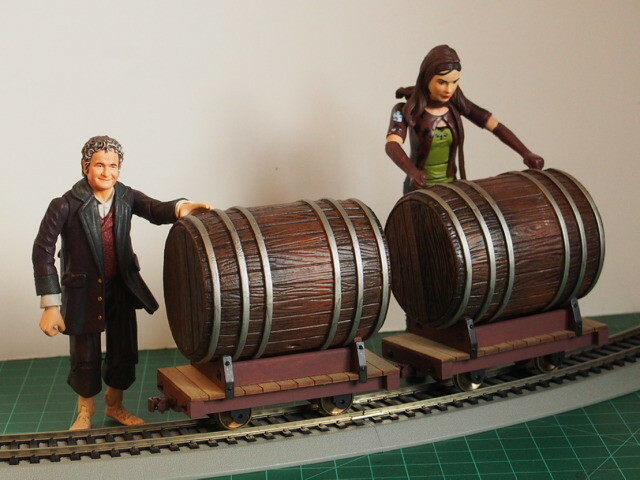 Liking the effect in 1:12 scale, I made a couple of cradles to allow them to carry a pair of toy barrels that I had acquired over the years. 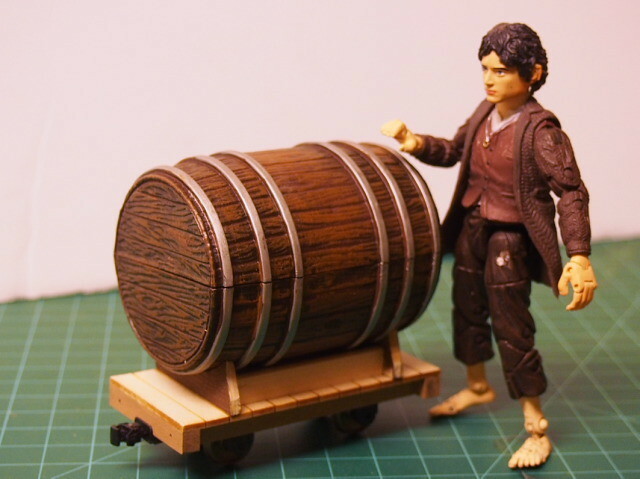 The barrels are accessories for Lord of the Rings Bilbo Baggins action figures, when he celebrates his 111st birthday. These are pretty consistently available in the $10-15 range (US shipping) on eBay (search "111 bilbo"), and more rarely can be found for a bit less. They are a bit toylike in the level of detail, but might be improved with a better paint job. The cradle pieces are cut from 1/8" thick basswood, with NBW pieces from Grandt Line added. 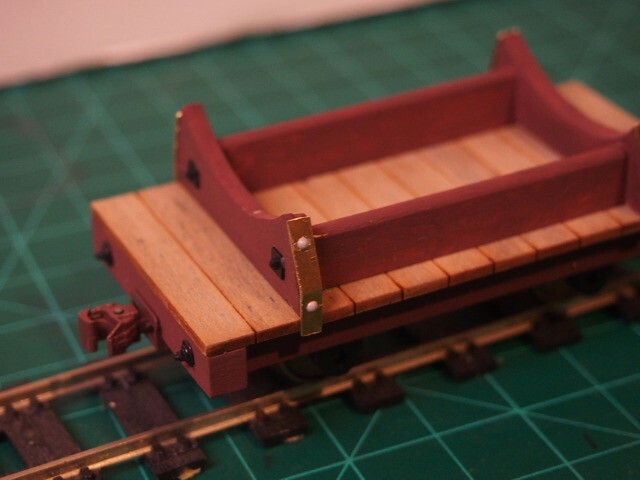 1/8" thick strips were cut from K&S sheet brass, bent, and glued onto the sides to straddle the deck of the car. Grandt Line 0.063" round rivets were glued onto the brass strips. 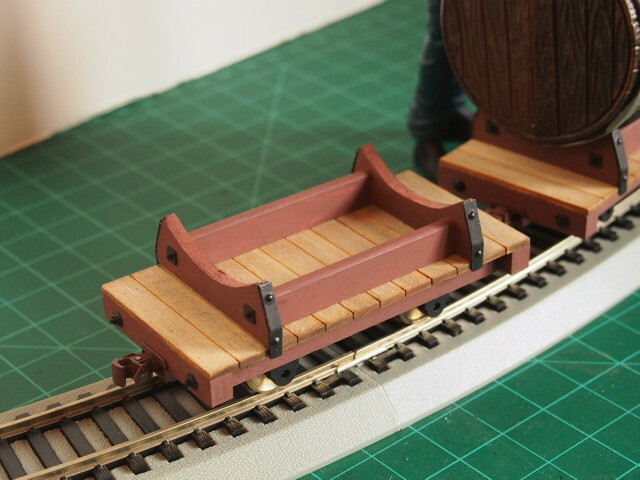 The cradles were painted Polly Scale Tuscan red-brown to match the 3x6 cars, and the hardware was painted Testors acrylic flat black. I'm not sure why these did not show up as images embedded in the post, pasting the URL in between the image codes in brackets. Do you have a link to those figures? and lastly you need to drop that URL between the sets of square brackets that you get from the top of the section in which you are typing when you click the Img button. And thus pretty pics appear embedded in your post. Thanks for the information. Any hint on how to get the particular photo size URL in Flickr? I see the link where I can download it in various sizes, but not where I can select a particular size to view. Last edited by Gnemo on Sun Oct 25, 2015 1:29 am, edited 1 time in total. The Hobbits are from the 6" LotR series by ToyBiz, and are 4.5 inches tall. Anna Paquin as Rogue from the first X-Men movie is 5.75" tall. This version came with a Wolverine figure and has a stabbing action "feature" (not a bug) where Wolverine can stab her pushing in a section of her torso and the tips of his claws extend from her back (wonderful toy for impressionable children). 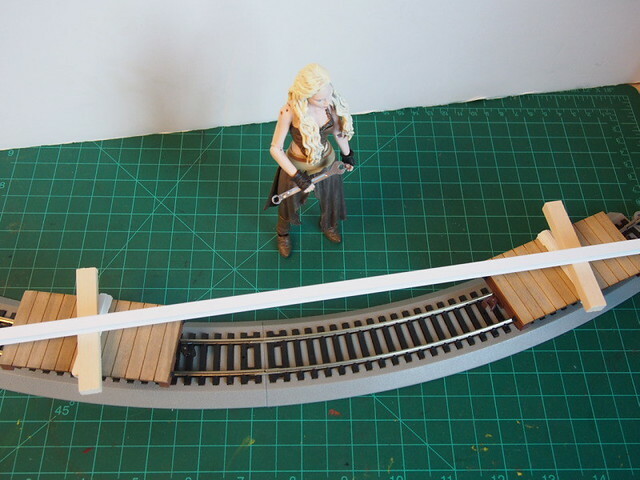 At one time, I had a smaller one w/o the action feature that was pretty close to 7/8" scale, while this larger one looks right for 1:12 (even if IMDB.com lists Ms. Paquin as 5'4" tall). Now I have a Mac, so if you have a Microsoft PC we may differ in this next step. I do a Control click on the photo itself which give me a box as shown. Unsurprisingly choosing 'Open Image in New Tab' opens a new tab with just the photo - so that's where you need to get to. It is the URL for this photo sitting there on its own that you need to drop into the IMG brackets here in The Gnatterbox. As you have seen, what you were doing before is simply grabbing the URL of the Flickr PAGE rather than the photo itself. Phew, told you it wasn't that straight forward. Looks as though the trick is, once viewing the medium-size image page, then right clicking on the image and selecting "copy image location" (Mac), then pasting that between the "img" markers in the post. What a pain; no wonder the instructions for the forum reference PhotoBucket. The problem with posting guides on how to do these things is that they constantly decide to "improve" the platforms and change the way you need to do it. Over at NGRM online they have a set of guides which might help http://ngrm-online.com/forums/index.php ... lp-guides/ Note though, their forum software is not the same as ours and they may very well be out of date already. You need to join up there to see them. It's possible now to directly upload photos to the forum - use the attachments tab at the bottom when you post. Having decided you have a liking for 1/12 scale do you have any early thoughts on taking this further? Enquiring minds would like to know please. The base unit is made from 3/8" long sections of 1/4" styrene angle, with cross bars of 0.040" styrene cut to match the length of the angle sections and topped with 0.100" x 0.156" styrene. The corners were rounded smooth and the center of the bars drilled to accept a bit of 1/16" brass rod. 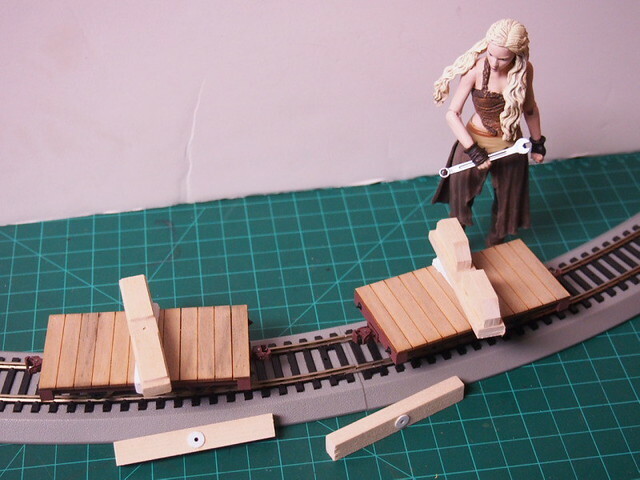 The bars were then cemented onto the angles while placed onto the deck of a flatcar to set the spacing. The cargo bars were cut from 3/16" thick basswood (1/4" thick for the timber forks) with a hole for the brass pivot rod drilled slightly oversize and a roughly 1/4" dia. washer cut from 0.020" styrene added on the bottom to reduce friction. 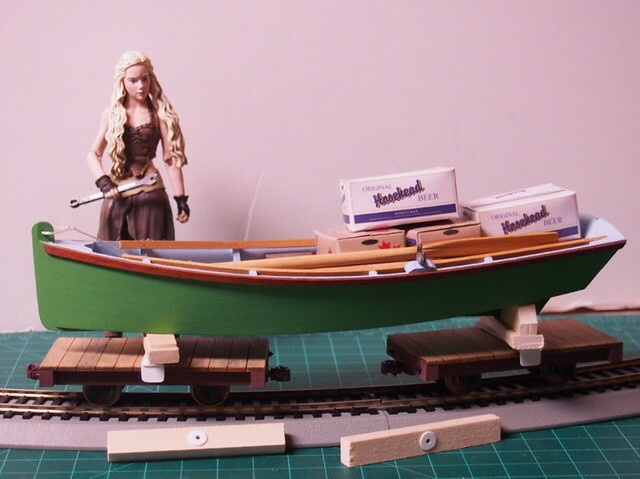 One set of bars was provided with supports to form a cradle to let the estate owner move a small rowboat (Midwest’s 1" scale “Skiff” kit - gift from a friend which was my introduction to model building in wood). Still need to make some upright posts and associated hardware for a pair of timber forks, and then wait for either warm weather or enough accumulated spray-painting projects to justify heating the house to a civilized temperature. Currently working on converting an On30" Bachmann 2-6-0 into a 1:24 scale 0-6-0 to be equipped with two alternate tenders, one for Hn16" and one with interchangeable seats to work in either 1:12 scale or 1:18 scale (since I'm sure that the allure of 1:18 scale will arise again some day). Also considering making a 1:12 scale seat and controls that can attach onto my 1:18n1 battery loco (scratchbuilt shell over a cheap (Model Power? AHM?) Hustler) to allow running my 1:18n1 cars as 1:12 scale. The 1:18n1 train was featured on page 97a of Carl Arendt's Small Layout Scrapbook. http://www.carendt.com/small-layout-scrapbook/page-97a-may-2010/ These cars are incompatible with the half-Heywood cars, as the couplers (Kadee O scale) are mounted higher, and they have a visually much clunkier look. And, since the 0-6-0 is limited to about a 15" radius, I am thinking of converting a small cheap steam loco (Model Power Docksider or the like, perhaps splurge and use a Bachmann Porter) into a small steampunk loco with the operator sitting atop the boiler, as something smaller to get the half-Heywood cars around a tighter radius. Last edited by Gnemo on Thu Oct 29, 2015 2:08 am, edited 1 time in total. With regard to the simple and easy way of attaching photos, does that create eventual problems with limited storage space as discussed in the instructions when the forum was first set up (and when online storage space was likely less generous)? Eventually yes, we will run out of storage, but we have about 200Gb available. A typical photo is about 1mb so we have space for around 200 x1000 = 200,000 of them. I suspect that by the time we do use it all, it will have gone cheaper again and we will be able to buy more for the same money. Either that or I'll just stick an appeal on here looking for more donations ! But for the moment, feel free to use as much as you want! Timber forks. Brass strip-bending photo is unfortunately a bit blurry. Bending the brass strip over 3/8" square machinists set-up blocks. Wood beams are a bit over 3/8" wide, 1/4" thick, 2-1/2" long. I found it easier to trim the wood to match the brackets than try to bend the brackets to fit the wood. Bracket pieces from 1/4" wide brass strip. 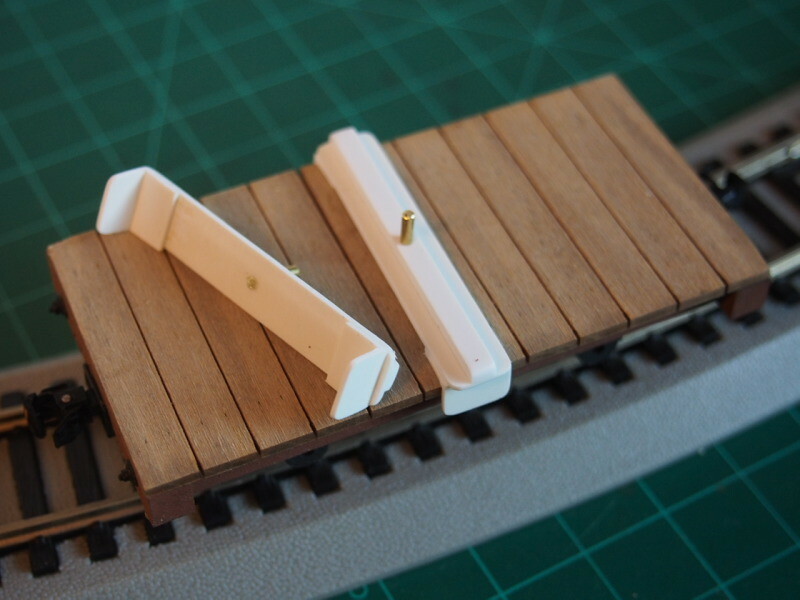 Uprights are 1/16" brass rod (about 1-5/8" total length), inserted into holes in the beams and with styrene tubing drilled out to fit at the bases. Completed fork, ready for paint. These are pretty much done until either warm weather or until I accumulate enough projects to make it worth heating the house to spray-painting temperature. Is there a 3-attachment limit? Seems determined to not let me attach a 4th photo. Gnemo wrote: Is there a 3-attachment limit? Seems determined to not let me attach a 4th photo. At the size of those pictures we can store 2,000,000 - think this will probably be enough. Weather in northern New England has been unseasonably warm, allowing a couple coats of Krylon flat black spray paint. Also applied weathering stain (methyl alcohol with drawing ink) to the cross-bars, but the effect is too subtle to really show.